This month we focused on the topic of nutritional skincare and how to prepare your skin for the changing weather. The snow has almost completely melted, and we’re finally feeling the warmth of the sun. Layers are coming off, meaning more skin is exposed to the sunlight, which so many people are unfortunately afraid of. Our goal is to empower people to trust their skin and take advantage of the sun’s benefits. We are all a part of nature, it stands to reason that our skin understands the elements and botanicals. For more information on preparing your skin for warmer months, and enjoying the sun chemical-free, check out our recent blog here. It’s all connected to the quality of food we feed our bodies. Our skin is a mirror of what is happening inside the body. So if you have a concern with your skin, like acne, uneven pigmentation, or lines, notice the areas that these issues appear in. 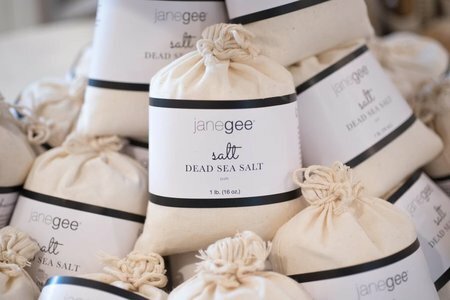 At janegee, we use face mapping to help us determine what is going on in your body, and thus help heal and treat your skin concerns. 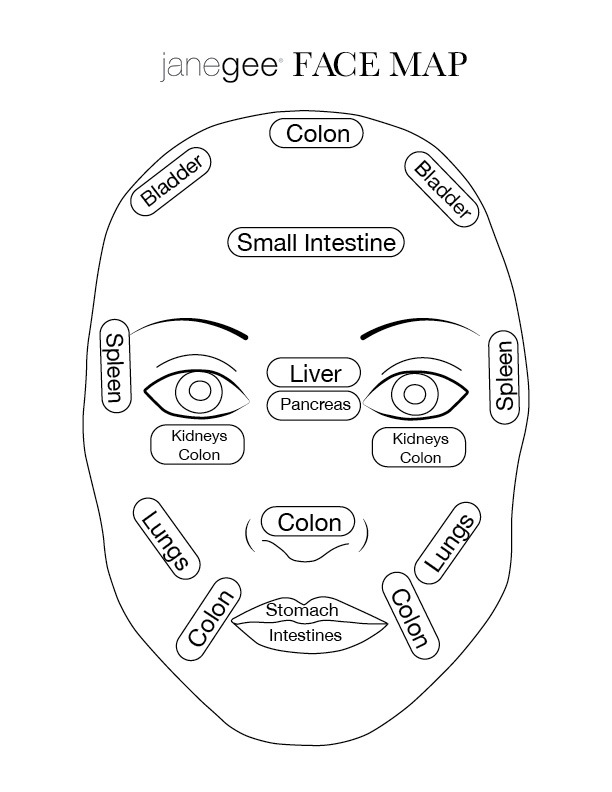 Areas on the forehead can signal problems with the colon, bladder, or small intestine. Dark under-eye circles can be related to problems with the kidneys and colon, and the cheeks are the windows into the lungs. It can also signify a deficiency in vitamin D3. 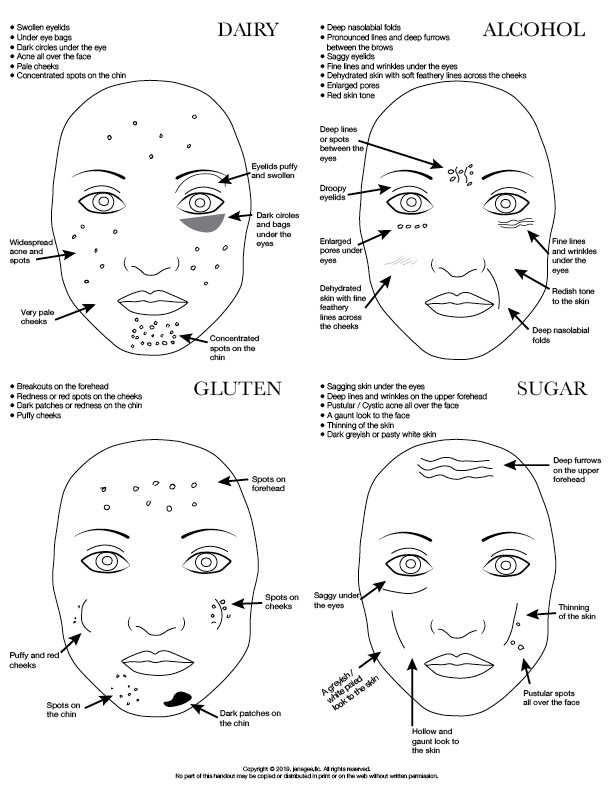 Consuming too much dairy, alcohol, gluten or sugar can also cause specific marks to show on the skin. See if your face has any of these characteristics, if it does, you may need to adjust your diet. Embrace yourself, accept yourself, focus on your health, and your body will reward you with a healthier skin. I have always believed that when the skin is healthy, your body is vibrant with positive energy. A healthy skin is a beautiful skin. Feed your body with food as close to nature as possible. Use natural skincare and personal hygiene products. And connect your body to nature daily through sun exposure, earthing, and air bathing. Beauty is more than skin deep. Become mindful of what you say to yourself, pay attention to your thoughts. When someone gives you a compliment, quietly acknowledge it and say, “yes, I did do a good job”. “I am great at that” etc. The positive talk will raise your self-esteem, no one can do that for you but you! And now you will be radiating a frequency that will bring only good things to you. You don’t need a medicine cabinet full of products to have beautiful, glowing skin. All you need is a good cleanser. One that balances the pH of the skin and allows vitamin D to be synthesized correctly. Never use a surfactant on your skin, nothing that soaps and foams. Never use anything that exfoliates, scrubs, or peels the face. These products damage the Stratum Corneum (the first layer of your skin). It must be kept intact to have clear, smooth, youthful skin. The stratum Corneum is designed to keep you safe from harsh elements, protect you from solar rays, and keep invading bacteria and pollution out of your skin. When you use surfactants on your skin, you strip your skin of natural oils and protection. Your body is smart, when you strip the sebum from your skin, it will want to replace it. The oil gets trapped because the surface is tight and dry. The consequence is lumps and bumps and possible breakouts. In addition to a cleanser, you might need a treatment for you skin. For this reason, we offer a variety of Face Oils. Janegee Face Oils are designed for different bio rhythms and corresponding skin conditions. Carefully created essential oil blends can do wonders for the skin and are the perfect pairing to the right cleanser. The only other product your skin needs daily, would be a moisturizer, but only if your skin lacks moisture or minerals. There are multiple ways to bring moisture back into the skin. And no, drinking more water is not the answer. You can use a good oil blend on certain skin types, and/or a good moisturizer. I do not believe in a day cream and night cream. A really good moisturizer should increase micro dermal circulation and leave a fatty acid layer on the skin to protect the skin without disrupting the top layer of the skin. You should be able to use it day and night without a problem. Janegee Vitamin Creme is a great moisturizer to try. It won’t clog your pores, and it’s a powerful anti-aging product as well. 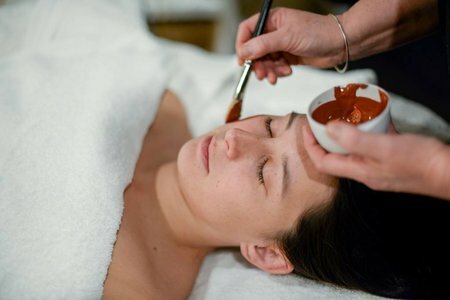 Our Marine Mask is a great way to add minerals into the skin, which is often why it could appear dry or flaky. The Marine Mask is pure Bladderwrack Seaweed, fresh from the Atlantic Ocean. It’s known for its mineral, vitamin and amino acid content. Just mix with water (or with hydrosol for extra moisture) and apply to the face once a week. The absolute best for your skin! To finish off your skincare routine, you need a weekly detox. With all the chemicals in our environment, a detox clay is a must. The particles from traffic fumes and environmental toxins are able to penetrate the skin as they are smaller than the pores in our skin. This weakens the natural barrier allowing the environmental pollutants to get into the skin. This same pollution breaks down collagen in the skin and eventually leads to problems with pigmentation and wrinkles. Similar to the Marine Mask, just mix clay with water (or hydrosol) and apply to the face at least once a week. By taking care of your skin with natural products, you’re also taking care of your health. Natural skincare is an investment in yourself. Be aware of what you’re putting on and in your body. Embrace yourself, accept yourself, focus on your health, and your body will reward you with a healthier skin. We have moved too far away from the healing ability of nature. We are all a part of nature.